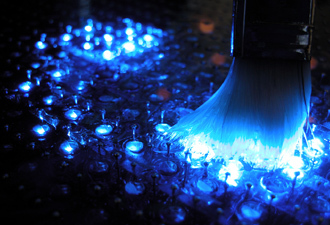 Water Lights Painting since 2006. This work is an interactive installation with lights and sound that encourages viewers to create various images with water on its surface. 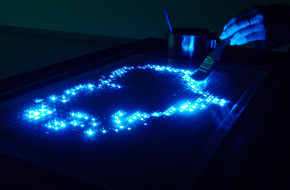 These gestures create changing patterns and images by illuminating LEDs whose brightness is controlled by each sensor in the painting's surface. The public contribute to this piece by painting with the wet brush or modifying the image by drying portions of it. The picture also causes making various movie patterns on the screen with sound. 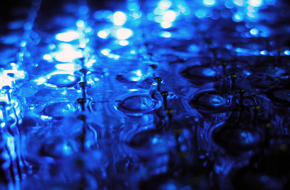 The work allows people to create their own sound through changing the shape of lights with water. It was from my interesting in various sound effects by viewer's visualizations. 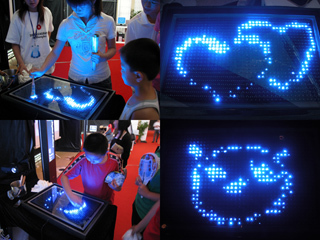 Water Lights in 2008 was created by LEDs (960 pieces), microcontrollers, and transistors for the lighting panel to interact with people. 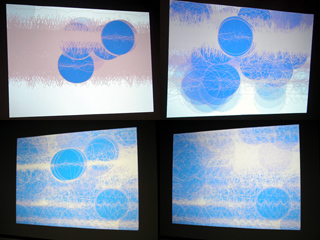 I, also, use the software, Processing and Max/MSP, to make the moving images and sound.